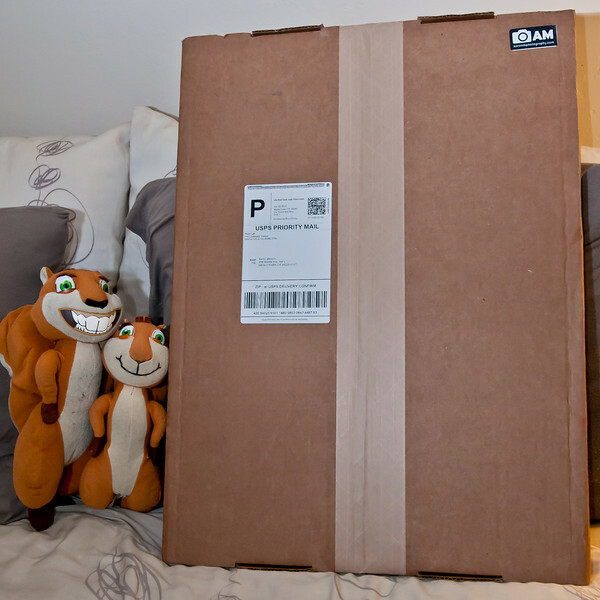 Here you can see my pets (Hammy and Brenda, from the movie "Over the Hedge") introducing my first set of prints from Bay Labs, via SmugMug. SmugMug offers Bay Labs prints as part of their printing options for their Professional account holders. Since I just upgraded to a Pro account I no longer have to use EZ Labs! EZ Labs printed and mailed all their photos in round tubes, but Bay Labs photos come in a flat box, which was super fancy. Once I cut the tape, the box folder out and had the photos inside. I ordered one 11x16 Giclée canvas board print and 2 of my photos as 12x18 prints on Kodak Lustre paper. 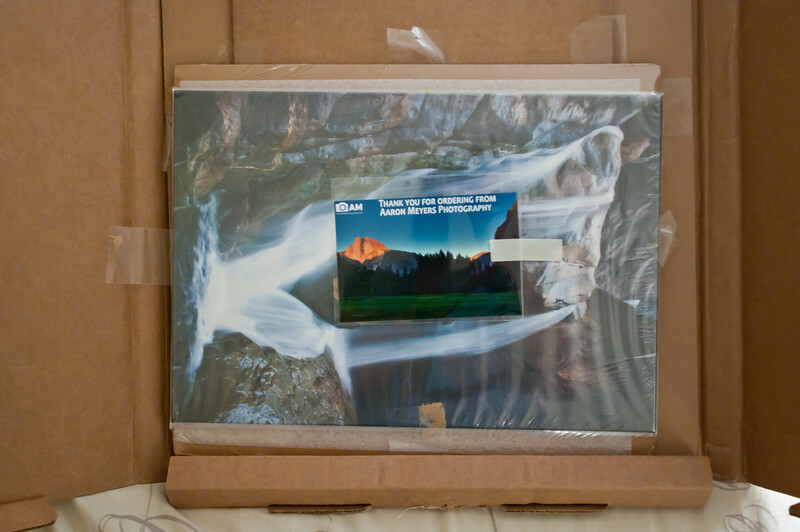 You can also see that SmugMug has my "AM Photography" logo branding on the packaging so people know where it came from! In this photo you can see the canvas photo after i opened up the flaps on the box from Bay Labs. Everything was super well packaged in this. The canvas board was surrounded by plenty of cardboard and there was no way to accidentally cut the canvas when opening the box. Additionally, on another board behind this were the 2 larger prints. You can also see the "Thank You" card that SmugMug prints with all my packages! Here you can see the photos and canvas board that I printed. I was very pleased with the prints from Bay Labs. The color and detail on everything looked great! I'll break down my thoughts on each of the prints though: Left: Waterfall down granite rocks -- The print on this came out great, all the colors and detail were super crisp, sharp and vibrant. However, the large print really does highlight the fact that there's a lot in this photo, and no real subject. I wanted the waterfall to draw the eye through the photo but it's just a bit too small. Center: Bridalveil Falls, Canvas board. I was pleased with the canvas print, however, I was really disappointed in this one. This was apparently NOT the right photo to print on canvas as there is a lot of really small details in this photo that just did not come out well on the canvas texture. Oh well, at least now I know. Right: For the most part, I think this print came out great! In many places, it was better than expected. However, the one thing that turns this print into a "waste" (almost) is the center of the photo where everything got *really* blue. I went back to my original photo and it's also REALLY blue. It brought out the little imperfections in my photo and I'm going to have to go back and re-edit the photo to remove the blueness. I'll have to reprint it when I get the new version done. Oh well. Center, bottom: I think my thank you photo came out the best of everything!